The bright, white light of a flawless midwestern day begins to fade and the filtered, dappled light from the treeline begins to cast it’s spelled over the potager. The evening is here. I often wondered how I would adjust to living three hundred and fifty miles further north than I’ve ever lived. Why would a gardener at heart inflict such pain upon herself? It’s been just under eight months since our life change; eight months since we moved to this stunning, beautiful peninsula and every single moment has been spectacular. It is a different climate to be sure, even though it’s the same gardening zone. The day to day differences from Chicagoland is a relief. True, we still have that swampish, Midwest humidity but there are no scorching ninety-eight degree days to accompany that moist air and come late afternoon, the breeze arrives off the lake (if it wasn’t there already), the humidity lifts a bit and relief settles in. 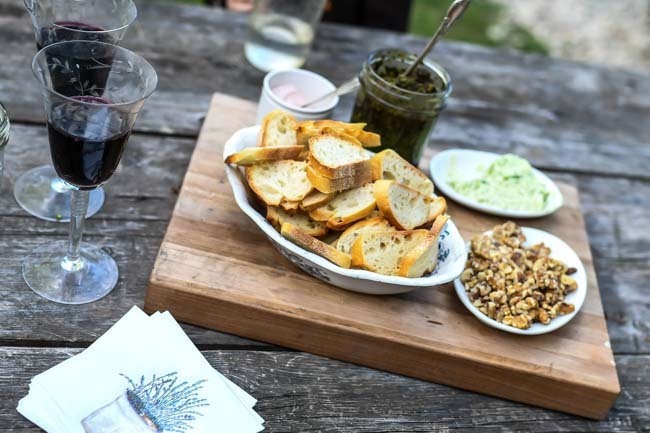 The summertime palette calls for melons, meat prepared outside, light cheeses…Heat is oppressive and can ruin the appetite but living here I’m no longer desperate to create dinner time meals that are light and refreshing. 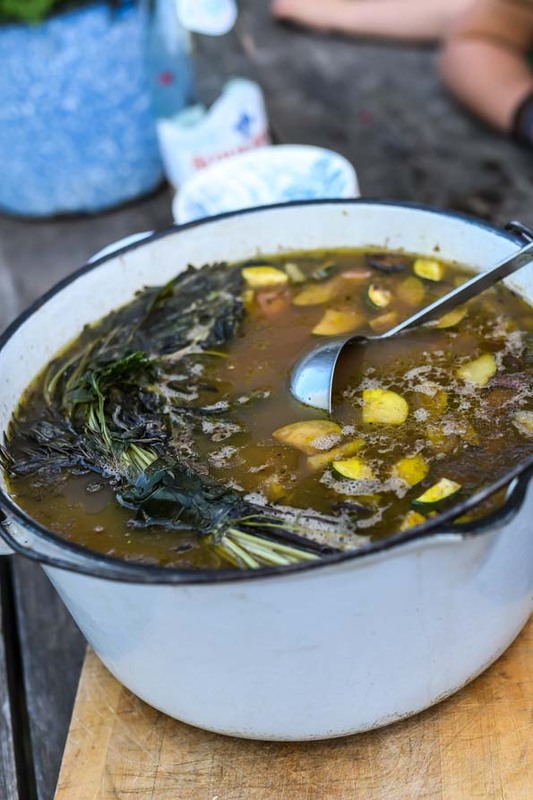 We can actually enjoy a bit of hot soup in the summer and not suffer for it. 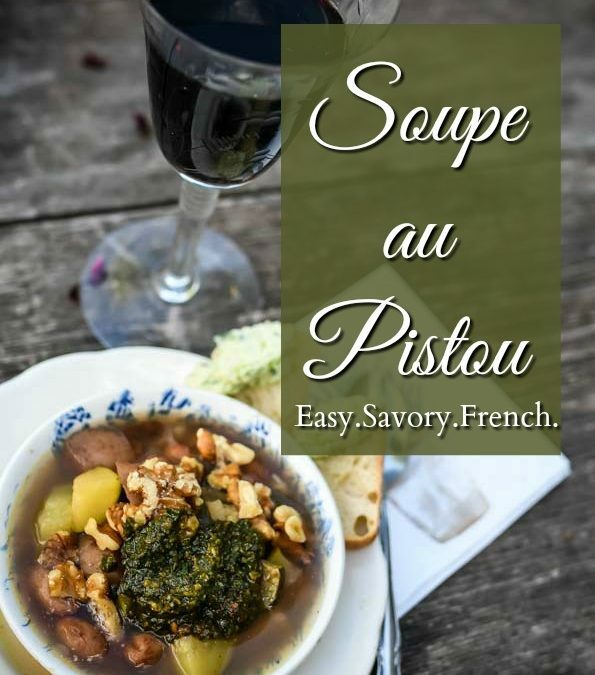 Our favourite is the soupe au pistou recipe. We are here together all day. 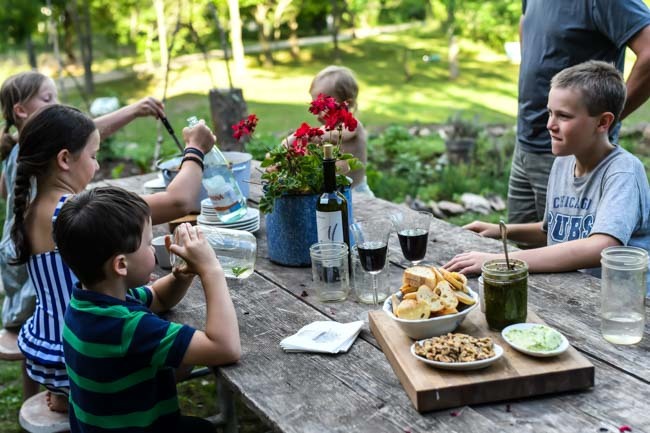 As a full-time family, each does his or her own thing somewhere on the property and dinnertime is often a collision of the day. One of us has been in the kitchen, another in the garden, two playing legos, one playing the piano, one chopping down another tree… and then I call, á table! 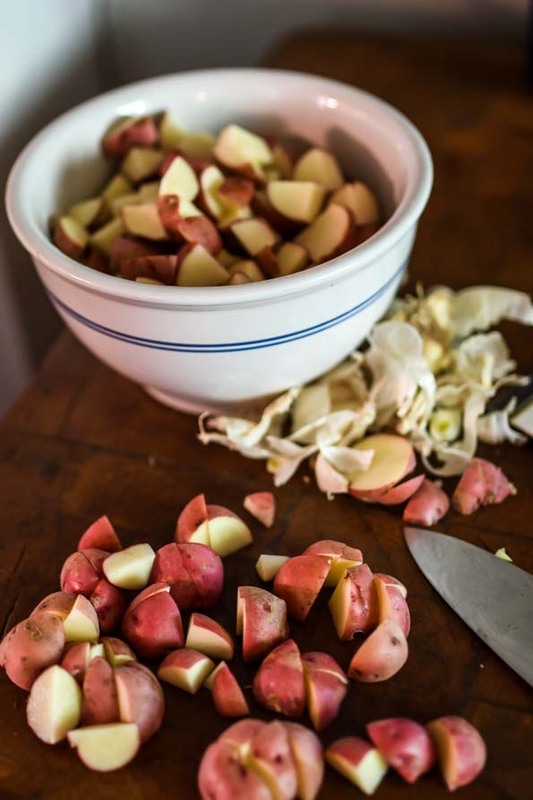 There’s the clanging of dishes, the hunt for enough spoons; everything is gathered and carried outside. With eight of us, there is a ton of energy at mealtime, especially those few moments before. 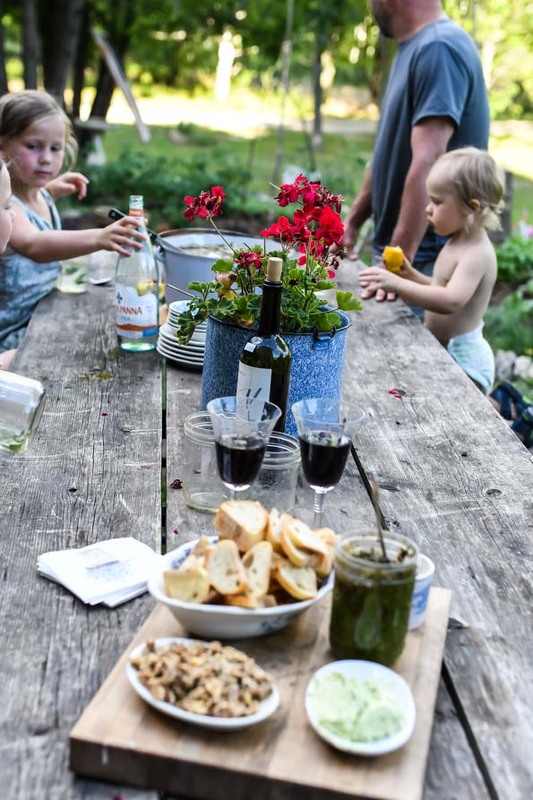 Some are standing, some are sitting, giggling, squabbling… wine is being poured… and then we settle… a prayer is prayed, wiggling stops and we come together to enjoy each other’s company and savour the efforts of the garden, our homestead and my time in the kitchen. Soup with pesto, simply put. 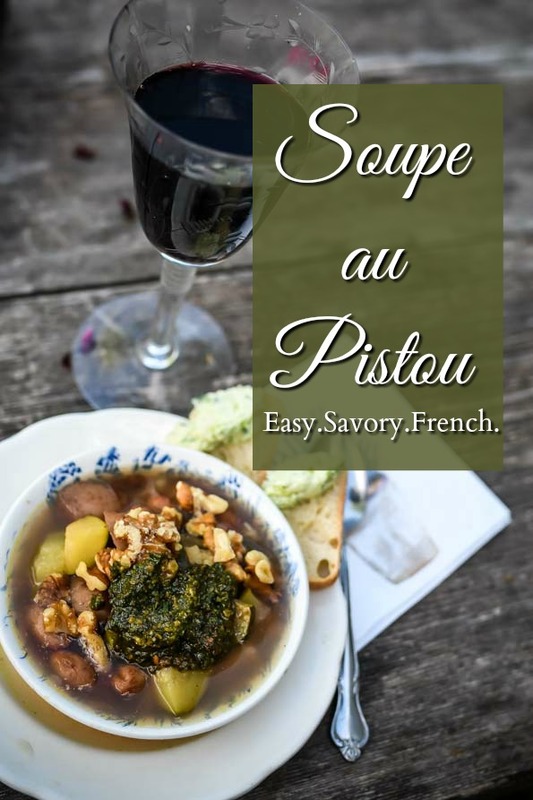 If you don’t want to mess with calling it “soupe au pistou”, who cares! Call it basil soup if you want. And about basil… sigh. This year my geese have decided that all my shiny green, lush, gorgeous basil was theirs to harvest!!! I am patiently waiting for it all to grow back! Thankfully, there remains a tiny bit of last years harvest in the freezer, stored in ball jars in the form of pesto. ‘Cause you gotta have pesto for soupe au pistou. Who would have thought that a dollop of pesto on top of a bowl of soup could make such a difference? But it adds that delicious mineral, herby taste that I love so much. Add a few extra walnuts for crunch and what you have is sheer soup perfection. I use dragon beans from my favourite Chinese farmer at the farmers market back down south. Oh, how I miss his gorgeous produce table, but late last year I worked out a deal with him and stocked up on beans, potatoes and whatever else I thought I didn’t grow enough of. (You can grow your own or get a variety of this bean for your soup here in my new shop.) I think it’s terribly important to have a variety of dried beans on hand in your pantry. As a soup lover, I think they give you so many options when making soups and ragus. “Dragon beans” are one of my favs. Let’s make some soup together! A hearty, potager vegetable-based soup garnished with pesto and walnuts. Some variations of this recipe call for tomatoes and spaghetti, experiment with your favorite veg. French food so SO much about veg. You can't go wrong. You might like to try these crackers with you soup, or heck, just because of homemade crackers. We’ve used baguette slices too with herb butter (as photographed). Ugh, my geese are in the herb garden again! Darn it! Duty calls! What a wonderful recipe. Thanks for sharing. It’s over 100 here in Texas, but this will be on the menu once it makes it down to 89. Truly lovely pictures. 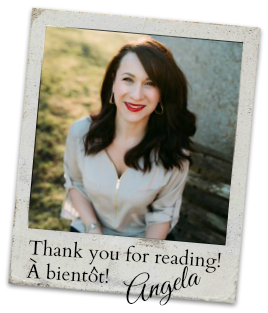 What a treat to spend time with your family in such a nourishing and beautiful way. The link to your new shop is broken. I was looking for the Dragon beans you mention. How do you make your bouquet garni?